The Government will not support a ban on live exports due to the detrimental impact it would have on producers. Secretary of State Michael Gove at the Stirling Bull Sale at the weekend. 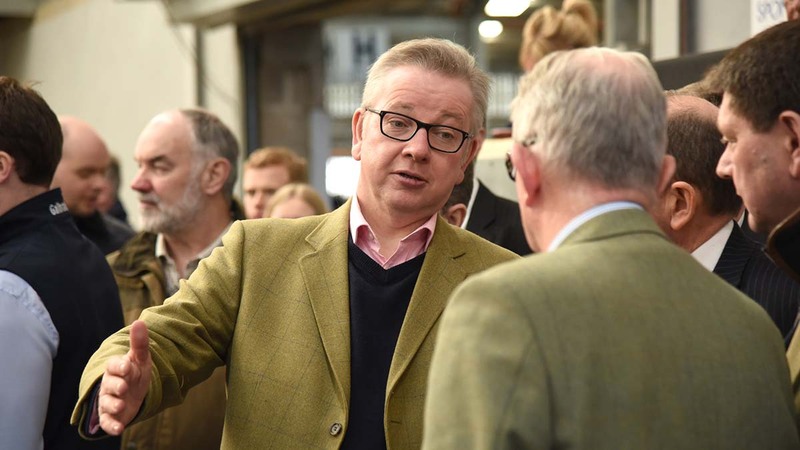 It was a case of being seen but not heard when Michael Gove visited the Stirling Bull Sale on Sunday (February 4). Closely chaperoned by an entourage including Defra staff and Conservative MP for Stirling Stephen Kerr, it was obvious that the Secretary of State for Environment’s priority was to have a photo opportunity amongst the bulls rather than to engage with farmers or the agricultural press. Unfortunately this made it impossible to the find out his thoughts over matters such as Brexit discussions with the devolved administrations. These were also omitted from his Oxford Farming Conference speech. Had Mr Gove been willing to be interviewed be would also undoubtedly have been asked to comment on a Scottish Government press release issued only hours before his arrival at Stirling. Scottish Rural Affairs Secretary Fergus Ewing claimed Defra Secretary Michael Mr Gove was intent on banning live exports. “Let me be absolutely clear, this is one UK wide framework the Scottish Government will not be participating in. I will not support anything that creates further challenges or difficulty for our farming sector or puts Scottish agriculture at a disadvantage,” said Mr Ewing. During the months when the fire-damaged Brechin pig abattoir was out of action large number of Scottish pigs were slaughtered in Northern Ireland. The prospect of a live export ban also caused disquiet at Stirling bull sales especially amongst breeders who have built up a good trade in Aberdeen Angus breeding heifers with Germany and Eastern Europe. Speaking from the bull sales Aberdeen-Angus Cattle Society past president and Alex Sanger said: “Scottish Government and NFU Scotland have to get on top of this straight away especially of it means stopping live exports altogether. The Orkney and Shetland economies rely entirely on live exports especially now the Orkney abattoir has closed.